LOL, well this is unusual! We had to drive into San Francisco today and got stuck in slow moving traffic on the Bay Bridge. It wasn't complete stop and go, just between 5 mph and 20 mph the whole way after the toll plaza. 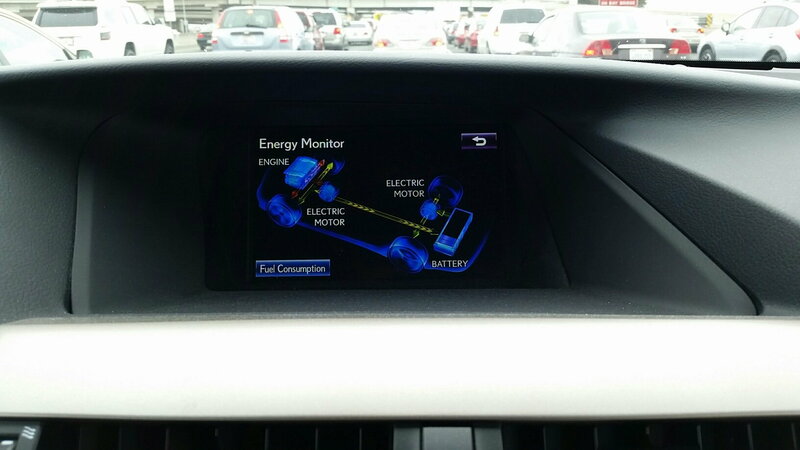 Our RX 450h went into all electric mode and stayed there until it finally drained the batteries down to the point the engine had to come on! I've never seen our mpg screen show ALL 60 mpg indicators yet! Lucky you. I just came back from a long trip (Reno to San Francisco). I noticed my After Refuel MPG is about 22, and that is pathetic. There must be something wrong with my car. Last year, I drove to Reno and was able to achieve 28-29 MPG (my best ever MPG) for the long trip. I have followed this thread for the last few years and noticed most people have better posted MPG than mine. My overall MPG is about 22.4, after nearly 5 years and 31k miles. At first, I was told by the dealer that the car needs to break in. Even if I occasionally try very hard to keep it in green zone for the entire trip and drive like an old lady, it won't improve my MPG much. This reminds me that my coworker sold her Toyota Prius because it can only achieve 36 MPG at its best, while other coworker's Prius can go up to 46-48 MPG. Anyway, I am bringing my car to Lexus Serraonte this week for check up. I think they will say it is my driving style and blah, blah, blah...Anyone has specific tips on how to get this lemon car fixed by the dealer? Thanks in advance. RC2010, first, I'm sorry you're as unhappy as you are with your RXh MPG. Hopefully you've spent some quality time reading this complete thread top-to-bottom, and honestly consider how you choose to drive your own RXh. There are many variables as to what contributes to either some of the best, or some of the worst MPG in an RXh. I've been a Lexus RXh owner since the first month they became available here in the US, and my experience (some reported in this thread and back in the 2nd Gen forum) is that my own MPG is similar to what you're seeing when I elect to drive the RX like a normal car, with a heavier foot on take-off, consistently exceed 60-65MPH on Interstates, even less when I have my RX loaded-up with 3 other passengers and a full cargo area, and additional impact when I have significant hills/inclines involved (like I do from here to Vegas and several places as I travel to the Sierra as you seem to also do). I also elect to keep my Aircon/Heat on AUTO nearly all the time, so that likely has some amount of impact on my MPG as well. I have proven to myself more than once I can achieve 30+ MPG in my previous RX400h and present RX450h, but it requires a very focused change in the way I choose to drive my RX -- that I elect not to do most of the time, as I too don't like to drive my RX like "some little old lady from Pasadena". As a result, I live with MPG a little better than yours, but I believe my RXh is operating normally and remains one of the best vehicles I've ever owned. While it sounds like you've made your mind up that you have a malfunctioning RX, and perhaps you do, my own experience would say you should first honestly attempt to allow your RX to achieve what its possible of. My suggestion is for at least one full tank, maybe two, balance out your local and interstate driving -- not too much of one or the other. Try not to do a lot of short in-city runs that don't allow the hybrid benefits to kick-in. Watch to keep your RXh in the ECO area on your left dial the majority of the time -- more than "occasionally" and not in POWER which will dramatically reduce your MPG -- especially on take-off, if you're having to take a bunch of hills, and when you're on the open road in the left lane. If you can't or don't want to do that, you will have lower MPG than what's stated by any mfgrs best-of-breed MPG, and honestly any hybrid, including the RXh, may not be the right vehicle for what you are expecting from your ride. Good luck in your pursuit. About a month ago a pre-owned 2009 RX450h (73000 miles on its shoulder) joined my 2010 Prius in the garage. 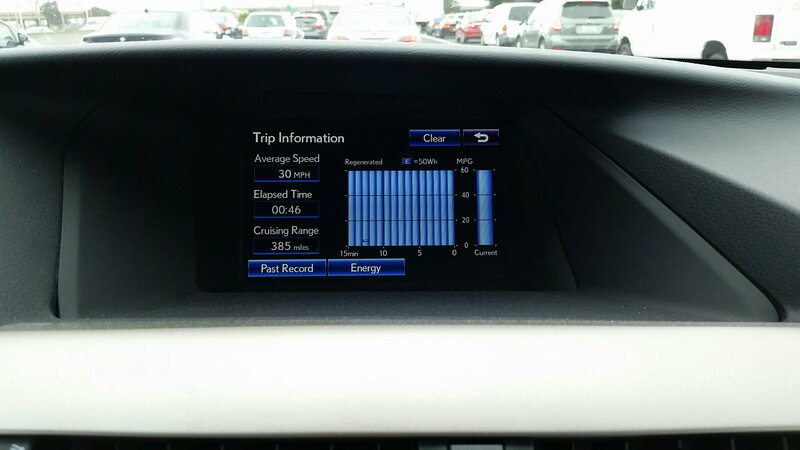 Used to the Prius frugality (50 mpg in average) , I was horrified by the past consumption records showed by the RX trip computer: 9 km/l (i.e. 21 mpg). Now, after about 300 miles mainly in the city, the trip computer shows 26 mpg, which although quite improved, to me is a bit disappointing. a short video I shoot at the startup) I have tried to found the sweet spot speed, which for my Prius is around 70 kmh (45 mph) and for the RX I believe is situated around 50 mph. As I already experimented with the Prius, the technique used to get the best costant speed consumption is to get quickly a speed above the sweet spot speed (5 mph above, for instance), then slowly release the pedal until the desidered speed is reached. If the traction battery is charged (i.e. SOC > 58%) the instantaneous consumption at 80-90 kmh (50-55 miles) is around 40-45 mpg, with the combustion engine happily murmuring under 1000 RPM. Viceversa, accelerating slowly just to the sweet spot speed, does not give these kind of results, with instantaneous consumptions around 28-30 mpg only. What currently does not provide good results, is the P&G (pulse and glide) tecnique, so popular among the Priusers. There are some factors to be considered at this regard. Firstly, the RX450h is an *heavy* beast, and since the rolling resistance is a function of the vehicle mass, the glides are quite poor. Secondly, the installed tyres (19" Bridgestone Dueler HP Sport) appear not too much efficient in terms of rolling friction - I still have to discover what is their strongness though.. finally, my RX is an AWD and this means more mechanical resistance for differential gear and of course more energy recovered from braking (around 20% more than Prius). Another key factor is the air conditioning, which drains a lot of energy from the traction battery. But where I live in the summer the climate is hot and often horribly humid, so there is not much to do at this regard. Based on my experience with the Prius, with which just adopting low friction tyres (17" Toyo Nanoenergy 2) I cut down consumption by 10%, I have started looking for low friction tyres even for the RX. Interesting way of finding your 'sweet' spot. Two things tho of clarification. You have either a 2009 RX400h or 2010 RX450h. The 450h version was not available as a 2009. That said, the 2010 RX450h started production in May of 09 (same month as mine). 2nd is the AWD. It may use slightly more gas (maybe 1 mpg more) than FWD only but due to weight (two more electric motors), not a rear differential. In the AWD version the rear wheels are driven 100% by electric motors, there is no rear differential in the RX450h. However, I believe that the potential is there: with the help of a Scangauge (3rd GEN Prius Xgauges work well, here a short video I shoot at the startup) I have tried to found the sweet spot speed, which for my Prius is around 70 kmh (45 mph) and for the RX I believe is situated around 50 mph. Mine is a RX450h, manufactured exactly in May 2009 - one of the first sold here, most probably a dealer' demo. According to the official data sheet, that here is unique for every car, there is a total of three electric motors. Since the Toyota/Lexus PSD contains two electric motors (MG1 and MG2) the third one has to be located in the rear. Hence, I think that some sort of differential device must be there, probably not evident because integrated in the same box containing the electric motor. Otherwise, it would be necessary to disconnect the electric motor during turns, in order to allow different wheels rotation speeds. My hybrid Camry was the same way. Seems this is a standard way of hinting to the hybrid control system programming that I don't plan on accelerating soon so safe to configure for economy instead of power. I think you're right about the rear motor. Unless the motor only drives 1 wheel and the other simply free wheels (unlikely), there would need to be some differential gear mechanism within the electric motor housing to allow each wheel to rotate at different speeds. Last edited by Droid13; 06-13-15 at 07:56 PM. Best answer I have ever seen on this blog.Well though out and politely stated. Also -- right on the money. Sure is a sweet spot. I believe all hybrids have a learning curve. They figure out your driving habits and your mpg will reflect those habits. 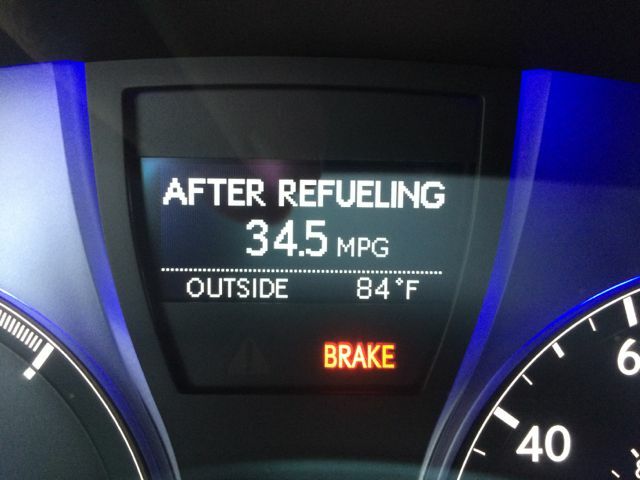 Take a slow approach and build up your mpg by using all the great tips you receive. You will then maintain a steady mpg with a half to a mile variant. Up or down hill,stop and go,highway your mpg will stay to that variant. I have built my 2015 450h up to a steady 30.5 with the variant. Also I believe there is a breaking period with any auto. Mine has only 2,040 miles on the clock. I' m looking to achieve 32-33 with the variant. If it hits that with consistency I will follow up and be one happy camper. I might add I do not find any difference with the heater or AC going. I did pick up the auto in March so a variant for mpg in cold weather could be more pronounced. I just filled up for the second time since picking up my RX. This time there was no excessive idling from either orientation or fiddling with things. 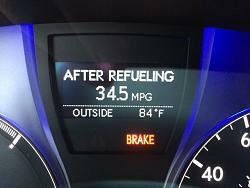 The display showed right around 30 mpg. The calculator says 30.3. I'm very pleased with that. My trips are mainly short to work, 6 miles each way. My overall average speed is 25 or so. I'm filling the tank once a month. There is a great video on Youtube that shows how the Toyota hybrid works. "3rd Generation Toyota Hybrid (eCVT) Transaxles". It shows how the engine, MG1 and MG2 are connected and work together. On AWD hybrids, the rear motor is connected to a traditional differential just like a drive shaft is in a RX350 but because it has less inertia than a mechanical AWD it responds much faster giving better snow and ide traction. One other thing that might improve your mpg even more is to use your cruse control. I have found my mpg to improve dramatically expecially when in the 30-35 mph range. It's quite dramatic. snowman22, appreciate the advice but I haven't found a road yet to go 50 MPH for any duration. Usually the majority of my driving entails trips under 10 miles. And I'm lucky if I can make it to 40 MPH between stop lights and signs. Plus those hills. It's great for pushing the MPGs up and charging the batteries. But eventually I have to climb back up them. The 450h dropped to a still respectable 28.4 before I filled up a few days ago. Unfortunately the gas station is down a few hills. 28.5 is excellent mpg for this large,beautiful,comfy SUV. Anyway you look at it--- you win. I haven't been over 23.5 MPG since I got my 2015 (in June of last year). I'm at 25.9 MPG on this current tank of gas. The best I've ever seen by far. Granted, I take short trips for the most part, so I understand that I'm not going to get the advertised MPG. I still wish it wasn't so far way from the 29 I'm "supposed" to get. I average 19% less than advertised, which, to me, isn't that great. Don't go off on me....I know how hybrids work. I know longer trips are better, etc. There's just no need for me to take longer trips. I've commented in other threads about it. I have had a few trips on this tank of gas that has been longer than normal, and I'm sure that's why I'm seeing the increase. By the way....I just reached 5,000 miles on my car....so yes.....i take short trips in it, even though I picked it up over 350 miles away and have gone back there once since then.